Help shape the future of healthcare in Ontario! 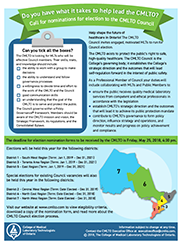 The CMLTO Council invites engaged, motivated MLTs to run for Council election in 6 districts of the province. The deadline is Friday, May 25, 2018, 4:30 pm.